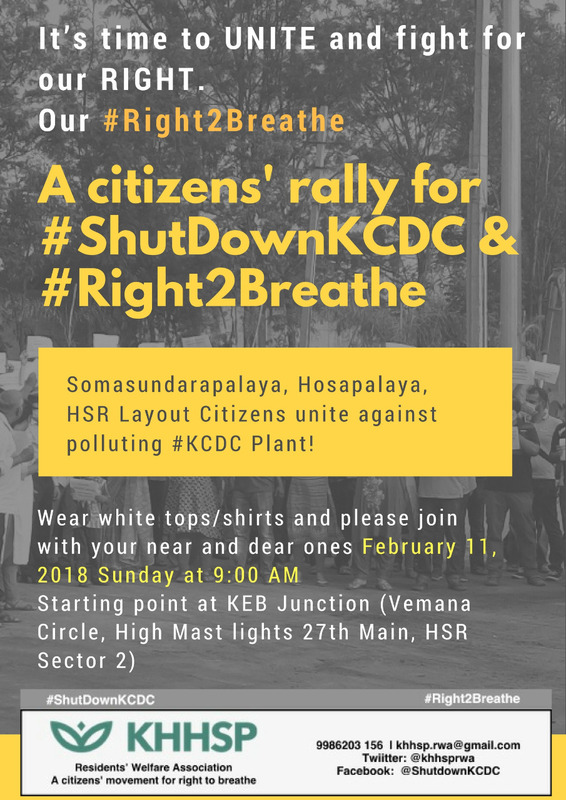 Residents of Kudlu, Haralur, Haralukunte, Somasundarapalya, & Parangipalya are getting ready for yet another peaceful protest against the Karnataka Compost Development Corporation’s Kudlu Compost Plant. 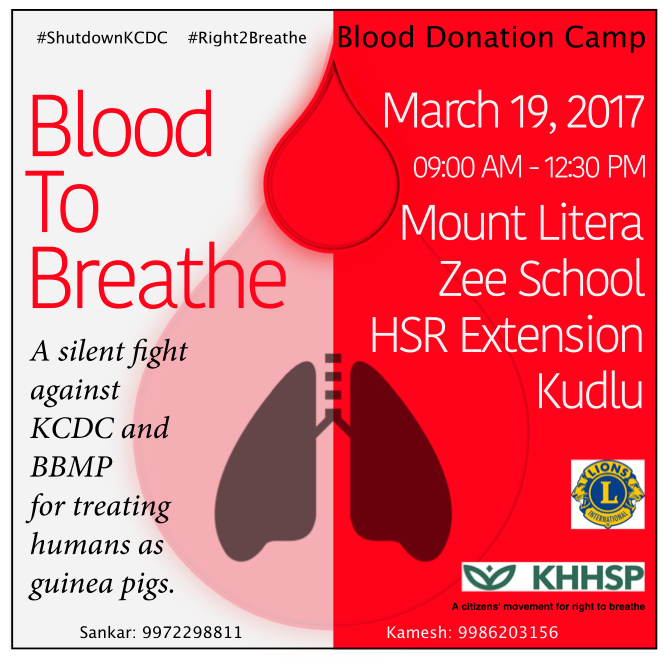 Last year we saw the #Blood2Breathe protest during which almost a hundred residents donated blood for the cause. 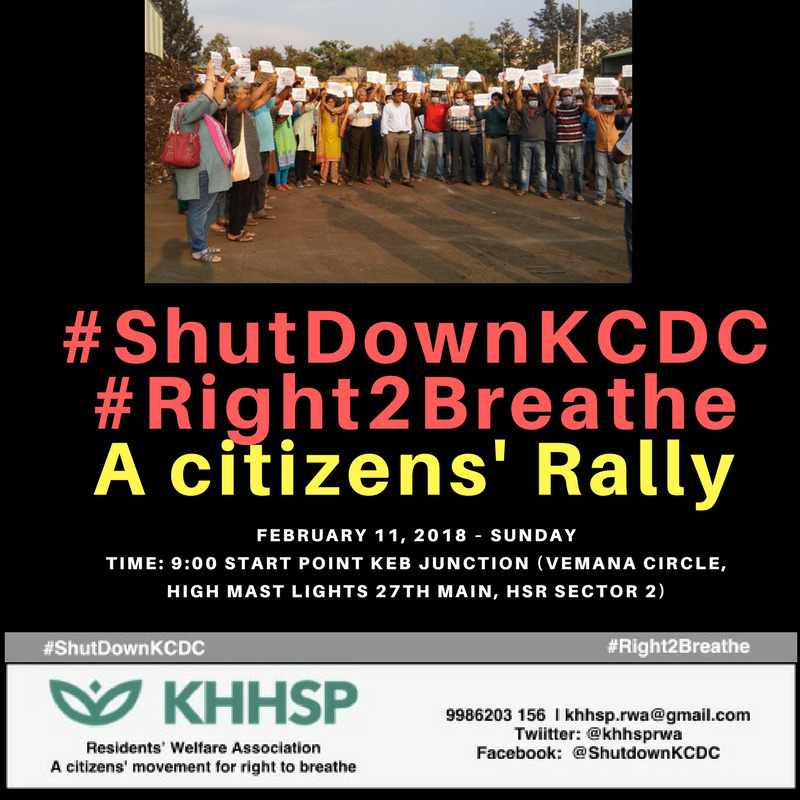 Under the leadership of KHHSP Residents’ Welfare Association, this time it is Citizens’ Rally for the #Right2Breathe on 11 February, 2018 (Sunday). The protest has been triggered by the official apathy towards the issue. Except few officials, such as Manivannan IAS, most of the officials have not shown any serious interest in fixing the issues the residents are facing for the last 5 years. The Joint Action Team (JAT) formed under the guidance of Manivannan IAS included residents from the area, officials from various departments (that need to take action to fix the issues), and people who showed interested in resolving the issues. While the first meeting saw most of the officers, attendance of officers in subsequent meetings reduced considerably. Even though there is a group chat for the JAT, several officials were too miserly to update the group on issues and developments. Several action plans that were decided during the initial meetings are yet to be completed. End of Jan 2018 was the deadline for almost all the action items. Reduction of Stench, Reduction of waste intake, and Removal of RDF from the plant were some of the major objectives. While the intake reduced for few days, January saw an increase again with the waste from Mahadevapura also reaching the plant. The quantity of RDF removed from the plant is negligible at this point. Rejects are stored in the plant making it comparable to a dump yard. The plant was started in 1975 houses came later — Yes. The plant was started in 1975. It was an open ground to process 70 tonnes of waste in Aerobic method. Later Vermi Composting was added to make quality manure. According to earlier news reports, the plant started accepting more waste from the surrounding area. When the stench became unbearable, residents protested and the plant was abandoned in 2008. From 2008 to 2013, the plant was in abandoned state. In 2012, an academic study was conducted in the area to find the “effects of abandoned compost plants on the ground water.” There are several observations in the study. The conclusion of the study points that No Site Suitability Study was conducted for this plant. The well water in the area is polluted and will take several years to revive. Officials have not given any convincing answer on real capacity of the plant. Does the 500 MT claimed by the officials mean: daily intake of 500 MT? Or Total waste at a time in the plant? 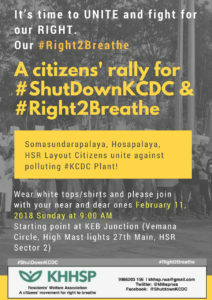 Buffer zone: Apartments in buffer zone of the plant; but no mention of lake and buffer zone for the lake — Almost 4 acres of Somasundarapalya lake is occupied by the plant. Lakes too have buffer zone rules and the plant falls within the buffer zone. The lake encroachment started from 2002. Waste was pushed to the lake to fill it and later on some “expert” advice, they did a mud capping. Last year residents reported fire on this mud capped area. Residents have recorded evidence of presence of SWM “experts” in the plant near the lake while leachate was being released to the Somasundarapalya lake. Several private encroachments on the lake bed were removed few years ago. But private encroachments should not be a reason for KCDC not releasing the lake area occupied by KCDC. 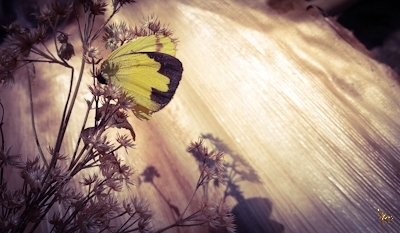 Since the plant was in abandoned state, people bought houses and apartments. While large corporations, such as Bosch, are forced to move their manufacturing facilities out of the city limits, why not this plant. Safety of workers — When residents observed that workers inside the plant did not have any safety gear, they raised it to officials. Residents are also concerned about the safety and health of the workers in the plant. The requests to install meters to measure the gases and air-quality, both inside and outside the plant, is still pending. Hope with this Citizens’ Rally, officials and elected representatives will understand the suffering of the residents in the area. © 2012-2019 Rajeshkumar (Raku), All Rights Reserved.